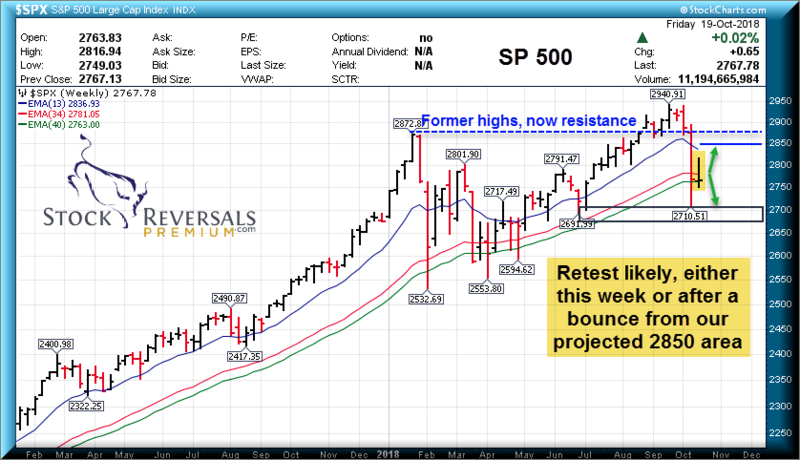 We also have Updated Weekly views of the SP 500 Index. Following last week’s heavy decline in the markets, the major indexes were still across the board with negative to positive gains for the week ending Oct 19th. SP 500 finished flat at 0.02%, with the Russell 2000 down -0.3%, Nasdaq 100 down -0.7%, and the Dow leading the week up 0.4%. As mentioned in last week’s report, we’re expecting a bounce attempt to 2850 before a retest of the 2710 lows. Last week’s highs of 2817 may have been all the bounce the SP500 will give us before retesting the 2710 low in quick fashion. At the end of the day, last week’s range was just an inside week to the prior down week, so it really can go either way here. We’re looking for a break of last week’s high or low to determine short term direction. A break of last week’s high will target the aforementioned 2850-73 region, and a break of last week’s lows will likely test 2710 or slightly lower. Therefore, ultimately beware that stock swing trading should continue to be choppy in this range until we retest the lows again. Bigger picture, we expect the markets to take some time to cool off the record bearish sentiment signals from 2 weeks ago. 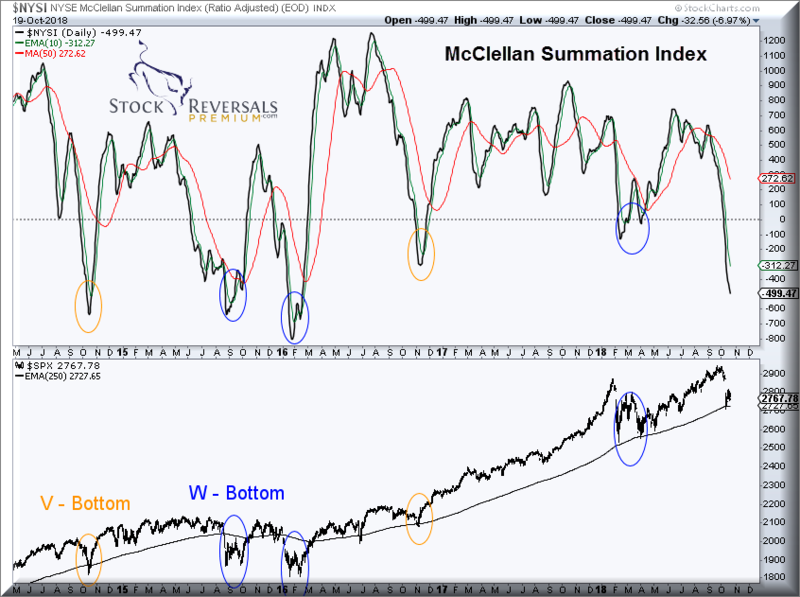 We we are watching for is a retest of the prior lows with positive divergence in the McClellan Summation Index (NYSI). See the “W Bottom” examples in the chart at bottom. 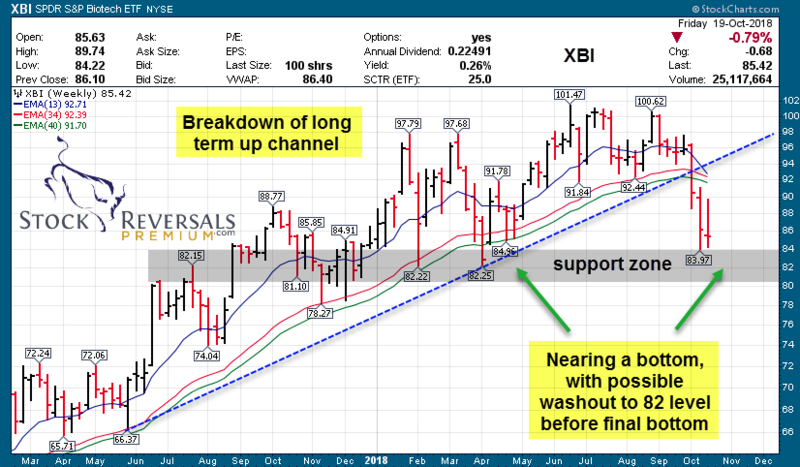 Biotech (XBI) is nearing major support zone in the 82 region, however as mentioned above with the SP 500, XBI finished the week as an inside week, so we’re on hold looking for either a strong bounce above last week’s high or another washout low to end the corrective leg started late Aug. Sentiment indicators are at some of the lowest levels in years, not to mention the market dropping the first 2 weeks of October has paralleled a common downside move previously seen in 2008, 2012, 2014 and 2016 – fitting a 2 year cycle pattern. As you can see, we use a combination of behavioral analysis along with the technical and fundamental approach to identify reversal pattern opportunities in stock swing trade setups in addition to our high regarded macro market forecasting. MTCH- 5 week correction from all time highs. On our list in the past before the big breakout. We continue to like as long as it holds 47.50. Provides dating products in over 190 countries online. SMPL – Strong relative strength in recent weeks. New all time highs likely. Food service company that develops, markets, and sells branded nutritional foods and snack products in North America and internationally. MOMO – ABC correction nearly complete. Closed last week below its lower weekly BB, indicating a reversion to mean should happen. 34-35 not out of the question, or 10-15% higher from here. Chinese provider of mobile social networking platform. PLNT- Bounced last week, almost 10% from its previous week’s low. Monthly uptrend still remains strong. Operator of over 1500 fitness centers. EEFT – 3 week breakout consolidation, room to 123 but must hold 109 gap. US provider of electronic payment services. SAVE – Strong outperformance vs. SP 500 last few weeks. American ultra-low-cost airline carrier. GRUB – 5 week correction, gap fill from late July earnings gap. Online and mobile food-ordering company that connects diners with local restaurants. ATKR – 8 week correction, with gap fill about .20 below current closing price. Manufacturer of Electrical and Mechanical products for construction markets. GOGO – up 9% last week, still breakout, consolidation stair step pattern. 7-8 price target not out of question near term. Provider of in-flight broadband Internet service and other connectivity services. SFM – 7 week consolidation cup & handle forming within a larger 2 year base pattern. Break above 29.67 opens up 33 level. Attempted breakout last month. American supermarket chain. WHD – Backtest of a large 20 week base, cup and handle pattern, approaching 13wma. Support in 36-37 zone. Wellheads and pressure control equipment.